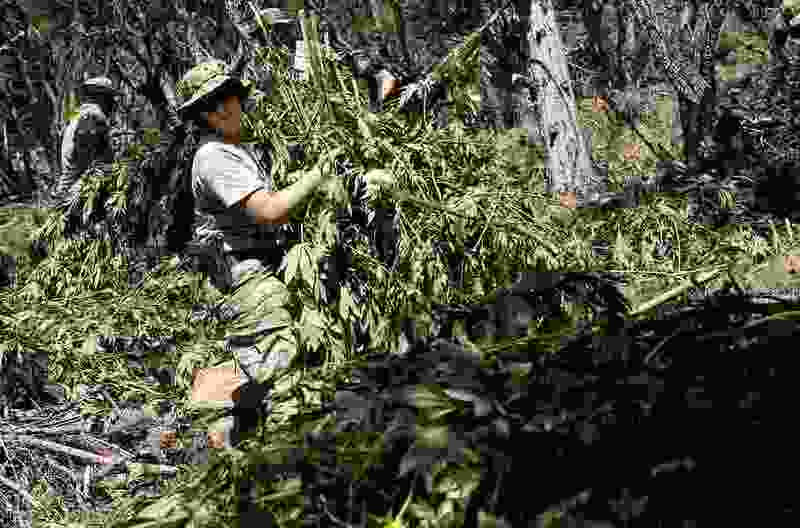 Tribune file photo Kelly Quernemoen, a special agent with the Drug Enforcement Agency, and other law enforcement officials gather marijuana plants during a pot bust in the Fish Lake National Forest near Beaver, Utah, on Thursday, Aug. 18, 2011. Several agencies were involved in the operation. No growers were arrested. Recent attention on reforming Utah’s marijuana laws has been focused on the substance’s medicinal value. But we must acknowledge that marijuana reform for many people in Utah is a criminal justice issue that can be rectified by reducing the criminal penalties for possession while contemporaneously expunging former low-level convictions. This rethinking of marijuana policy should be a top policy approach during Utah’s 2020 legislative session. Utah lawmakers demonstrated overwhelming support for criminal justice reform this 2019 legislative session by passing the Expungement Act Amendments, a bill that automatically removes records of past criminal convictions for qualifying persons. Reducing the criminal penalties for marijuana is also important in this time of growing support for criminal justice reform. To understand why we should decriminalize marijuana in Utah, we first need to understand why it became a crime in the first place. The first major campaign to criminalize marijuana was led by a government bureaucrat trying to protect his job. When the nationwide prohibition of alcohol ended in 1933 with the passage of the 21st Amendment, Harry Anslinger, the commissioner of the Federal Bureau of Narcotics, was in danger of losing his federal funding. To keep his agency and his position afloat, Anslinger had to find another menacing drug to regulate and criminalize. He settled on cannabis, or what we now call marijuana. Before Anslinger picked it, marijuana was not worthy of national attention like it is today. But that changed when he launched a deliberate campaign of exaggerated racist rhetoric to depict minorities as the primary users of a purportedly violence-inducing drug. Testifying to a congressional committee, he claimed that much of the crime in the United States originated from marijuana use by minorities, notably among Latinx and black communities. Anslinger even transformed the medical-sounding “cannabis” into a dangerous drug by recasting it as “marijuana,” the slang term used by Mexican immigrants speaking Spanish. Because the word “marijuana” sounded foreign, Anslinger hoped it would reinforce the racism he deployed to criminalize it as a dangerous drug. Anslinger’s campaign eventually helped pass the Marijuana Tax Act of 1937, which was the first federal ban on marijuana. Marijuana criminalization ramped up in the early 1970s when the Nixon administration declared its war on drugs. This effort was led by the 1970 Controlled Substances Act that placed marijuana in the same category as heroin, a Schedule I drug with no medical value and a significant potential for abuse. Other “tough on crime” policies followed during the 1980s and 1990s to amplify the war on drugs. Overall, these policies fueled the crisis of mass incarceration that resulted in the United States currently having the highest incarceration rate in the world, with a majority of arrests fueled by a racially disproportionate crackdown on simple drug possession. The mass arrest and incarceration of communities of color due to misguided marijuana policies also impacts communities in Utah. There is a need for more race-based data on marijuana arrests in Utah, especially from the Latinx community. But existing data from a 2013 ACLU report notes that blacks in Utah were 3.8 times more likely to be arrested for marijuana possession than whites. The report also noted that marijuana accounted for 36 percent of all drug arrests in Utah in 2010 and that marijuana possession accounted for 91 percent of all marijuana-related arrests. Furthermore, all those arrests for marijuana possession cost Utah taxpayers at least $14 million. More recent data from 2016 indicates that 6,082 Utahns were arrested due to marijuana, with over 5,000 of those arrests for possession. These numbers show that a significant amount of time, money and resources have been spent in Utah to enforce anti-marijuana laws that disproportionally impact communities of color. Possessing a few grams of marijuana in Utah today remains a class B misdemeanor that can result in six months in jail and a $1,000 fine plus additional surcharges and court fees. Moreover, misdemeanor convictions for marijuana can create a long-lasting negative impact on a person’s life and career aspirations. For example, those convicted can’t apply for federal education loans or grants, attain certain jobs, or hold certain professional licenses. We can do much better for the people of Utah by diverting our law enforcement resources towards more serious issues and individuals who actually pose a threat to society. We cannot afford to continue to support an outdated policy of criminalization against marijuana, a policy that from its earliest days has served as a tool to oppress and incarcerate low-income communities of color. Pedro Padilla-Martinez is an intern with the ACLU of Utah’s Campaign for Smart Justice and founder of the University of Utah’s NORML chapter.